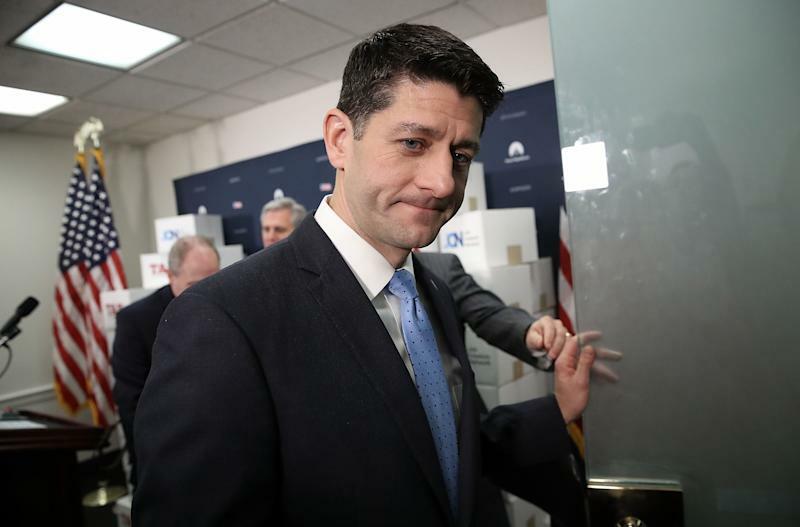 House Speaker Paul Ryan (R-Wis.) spent time Wednesday talking to Republicans who have lingering concerns about the state and local tax deduction changes in the tax bill. WASHINGTON ― House Republicans certainly look like they’re headed toward passing their tax proposal on Thursday, but last-minute concerns from some conservatives over the messaging of the tax bill is suddenly making leadership sweat. On Wednesday night, conservatives circled up with Majority Whip Steve Scalise (R-La.) on the House floor to discuss a key GOP talking point that conservatives don’t buy: that the average family of four will save $1,182 on their taxes. Conservatives including Reps. Thomas Massie (Ky.), Raul Labrador (Idaho), Scott Perry (Pa.), Justin Amash (Mich.) and Jim Jordan (Ohio) all huddled with Scalise and an aide to discuss the flaws in that calculation, with a number of conservatives suddenly concerned they might be “over-promising and under-delivering,” according to a member involved in the discussion. Leadership still seems to think those Republicans will come around. This is, after all, an argument over how much taxes are getting cut ― and these conservatives have long expressed support for cutting taxes. But the conversation has leaders double-checking their whip counts and perhaps building a new cushion for the tax bill. One advantage leadership has on this proposal is they control when they close the vote. If they really needed votes, they almost certainly could pressure some Republicans into supporting the bill, perhaps even offer some sweeteners to get the bill over the passage threshold. This sudden uncertainty, however, is coming as a bit of a surprise. Leaders have looked in command for weeks on this tax proposal, with an informal whip count composed by HuffPost showing only about 10 hard no votes on the bill. Republicans can theoretically lose 22 of their members and still pass the bill in the House, depending on how many members vote and if every Democrat votes no, as expected. But there are still a number of members leaning toward voting no and a number of other Republicans who still report being undecided as of Wednesday night. Chief Deputy Whip Patrick McHenry (R-N.C.) was working the floor feverishly during two vote series Wednesday, talking to a number of Republicans who hardly anyone has expected to vote no, including Jody Hice (Ga.), Andy Harris (Md. ), Charlie Dent (Pa.), and Scott Perry (Pa.). Later in the day, House Speaker Paul Ryan (R-Wis.) spent a good amount of time on the floor with Barbara Comstock (R-Va.) and Lee Zeldin (R-N.Y.), two Republicans who have lingering concerns about the state and local tax deduction even after leaders allowed filers to write off the first $10,000 of their local taxes. And Majority Whip Kevin McCarthy (R-Calif.) spent time working some California Republicans, most notably Tom McClintock and Steve Knight. Members and aides familiar with the leadership whip count still say they are confident, but a vote that was looking very easy earlier in the day is now being complicated by conservatives. The problem with leadership’s messaging about who would benefit from tax reform perfectly encapsulates the political difficulty of the GOP’s tax reform agenda ― a difficulty that flows directly from the policy itself. The most important feature of the Republican tax reform bill is a giant reduction in corporate and individual tax rates that would lose trillions of dollars of revenue. But another goal of the proposal is to simplify the tax code. In “simplifying” the tax code, Republicans are actually just nearly doubling the standard deduction and eliminating a slew of deductions that might actually end up raising taxes on some families. Certainly, if you’re from a high-tax state, such as New Jersey, New York or California, the ability to deduct your state and local taxes is a huge benefit. This is why most of the hard noes on this bill are coming from New Jersey and New York. The California Republicans seem to be counting on their individual districts not benefiting so much from the state and local tax deductions, which gives them license to vote yes. But, as conservatives pointed out Wednesday night, once you account for the money raised by eliminating other deductions, a relatively small amount of the cost of this bill flows to the individual side. The plan raises more than $2 trillion by eliminating deductions for state and local taxes and the personal exemption, which every household uses to reduce big chunks of taxable income. Conservatives are looking at the numbers and failing to see how leadership gets anything close to an average cut of $1,182 ― and they’re uncomfortable with Republicans touting that number if the cuts are actually much smaller. Again, these members may still end up voting for the bill. In fact, based on conversations with some of these conservatives, we’re putting most in an undecided category even though we think they’ll end up supporting the bill. But these concerns, coupled with some holdouts, like a few members from the Pennsylvania delegation, are putting leadership closer to a floor defeat than they ever imagined. All Democrats in the House are expected to vote no.